Daredevil is a well-known name for Indy craft beer drinkers. Their Lift-Off IPA, which took second place in the Indy Star’s 2015 #MaltMadness craft beer competition, is in bars and tap rooms all over the state. 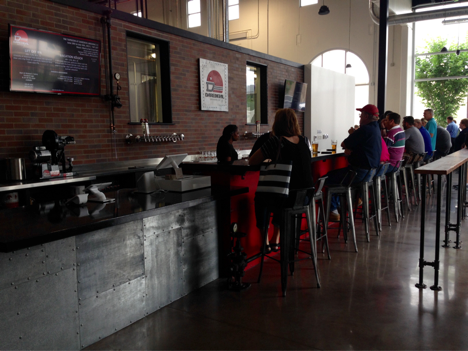 They spent their first four years as a microbrewery in Shelbyville on the city’s southeast side. 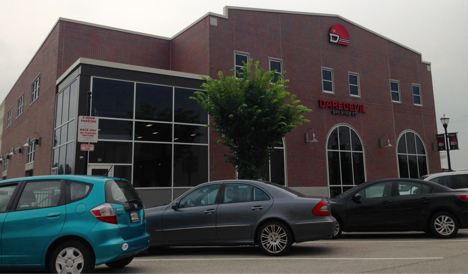 After their recent opening of the first newly constructed production brewery in Indianapolis since Prohibition, Daredevil will call Indianapolis their home. 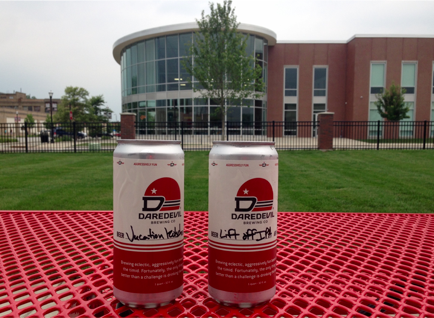 The facility, a production brewhouse and taproom with an 8000 square foot patio, is located on a two acre Main Street plot just blocks from the Indianapolis Motor Speedway. The building is neighbored by Dallara Indy Car Factory to the north and multiple other local businesses worth checking out. Foyt Wine Vault, owned by an infamous family of racers, is located just across the street. Bartender Michael Earman, one of only twelve full-time employees at the new location, says relations with Speedway and the rest of Main Street are awesome, two thumbs up in fact. Daredevil products are also available at Lino’s Coffee, Barbecue & Bourbon and Dawson’s on Main Street. Daredevil plans to be busy during race weekends and owner Shane Pearson will extend regular hours for the Brickyard 400 in July and several other events at the track. Although the tap room is starting things off slow, there are plans for growth. Only two brews are currently on tap: Vacation Kolsch and Lift-Off IPA are available for in-house pints, refillable growlers, and “Crowlers” to-go. There are no guest taps in the lineup, but more Daredevil brews, like Ripcord Double IPA, will be available on July 17 for their grand opening extravaganza. Crowlers, if you’re unfamiliar, are 32 ounce single-use cans which are made to order at the taproom back bar. A bartender rinses the aluminum, fills it with CO2 to rid the space of oxygen and fills the can with your draft selection through a hose attachment to the line. He or she uses a canning machine to seal the crackable can top, then slaps on a sticker label with the beer’s name. The whole process is completed in less than two minutes. Plan your visit soon, but keep in mind the facility is only open Wednesday through Saturday from 3-8pm. I inquired about possible openings for Sunday service and growler fills, but my bartender informed that owners want to count on at least one day off for their employees and Sunday fits that slot best. If you don’t have 4th of July plans, Daredevil Tap Room will host an Aggressively Fun 4th of July Celebration all afternoon and evening this Saturday, starting at 3pm, with live music from 4-10pm.